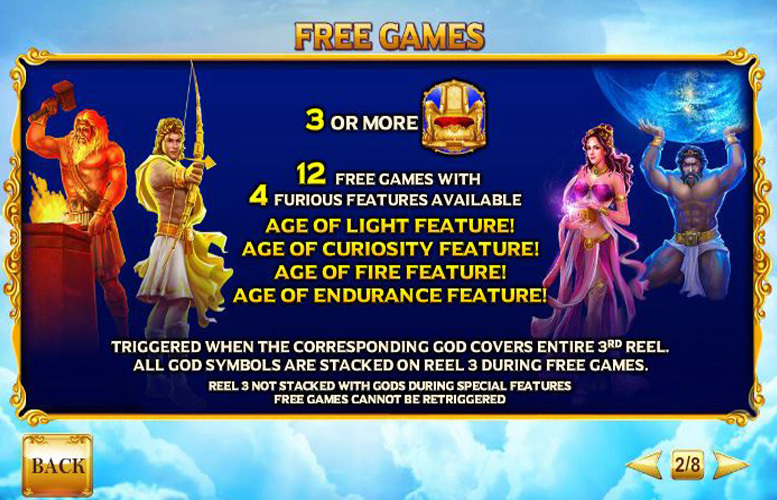 The Greek Gods are back again for Playtech’s Age of the Gods Furious Four slot, and this time they’re angry. A five reel and three row slot game, it is Apollo, Pandora, Haphaestus and Atlas who make up the ‘Furious Four’ in question. Line up five symbol combinations of those gods and goddesses and players will receive outstanding jackpots, whilst revealing the game’s scatter symbols will trigger brilliant free games with special ‘Furious Features’. Age of the Gods Furious Four is linked to fully four different progressive jackpots, all of which can be randomly triggered at any time. The slot’s graphics and images are fun and attractive, and add to the game’s interesting theme. Free games with four different ‘Furious Features’ add some extra interest to gameplay and make the game really immersive. The slot’s top payline jackpot, which can be worth a maximum of £50,000, is a little less generous than some. Compared with some of the other Age of the Gods range of games, Furious Four has fewer extra features. 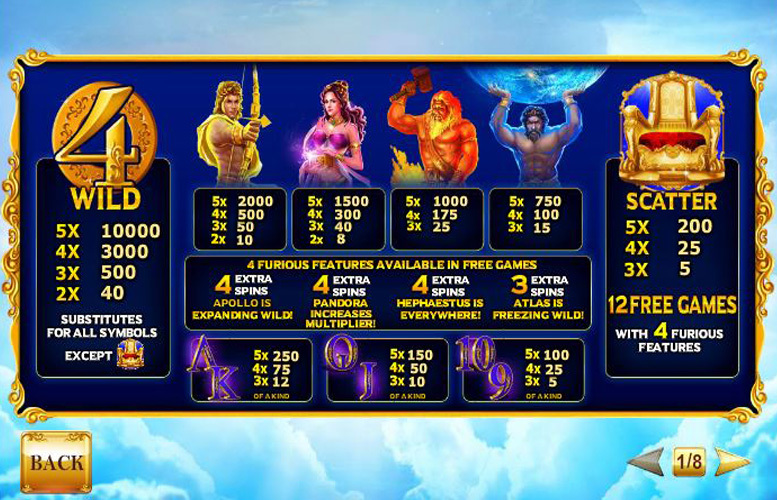 As well as being linked to four progressive jackpots, Age of the Gods Furious Four also features its own reasonably generous payline jackpots. 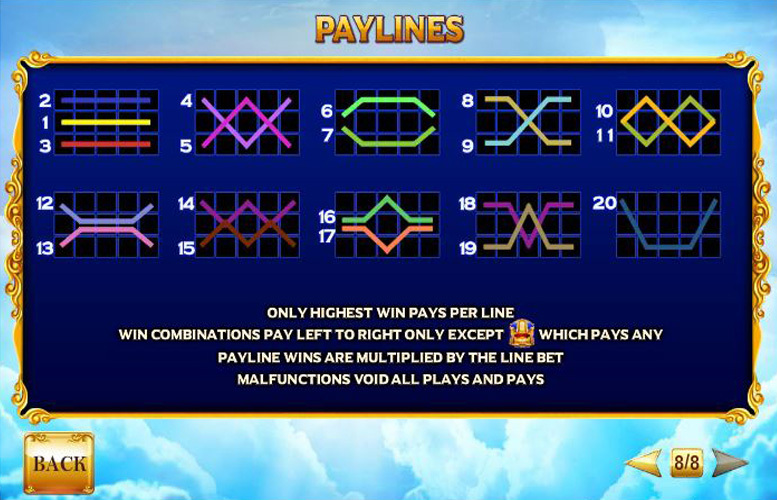 As with most five reel slots, the best jackpots are won when five matching symbols align along an active payline. The most generous jackpot of all results when the five symbol combination in question is made up of all wild symbols. That particular combination pays out at a rate of 10,000 times the player’s chosen line bet, meaning that it can be worth £50,000 if the highest line bet of £100 is selected. Entirely themed around four gods and goddesses from the Greek pantheon, Age of the Gods Furious Four also includes a number of additional features which largely stick to that theme. Able to make up the slot’s most valuable payline combination, the wild symbol can also substitute for any other symbol apart from the game’s scatters. When it does so, it will always substitute in such a way as to make up the most valuable possible payline combination. As well as wild symbols, Age of the Gods Furious Four also has scatter symbols which pay out instant wins when three or more appear. When those scatters do appear, too, they automatically trigger 12 free games which will be subject to one of four ‘Furious Features’. 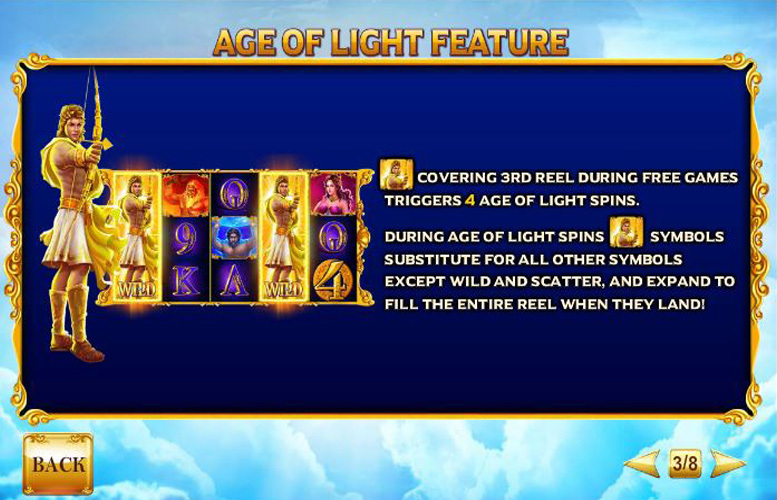 Each of those features are themed for one of the slot’s four gods and goddesses, add some interesting extra elements to the spins and have full details explained on the game’s paytable. In common with the other Age of the Gods slots, Furious Four is also linked to the Power, Extra Power, Super Power and Ultimate Power progressive jackpots. The Jackpot Game which must be played to decide which of the four a lucky player wins can be randomly triggered, and the size of the jackpots obviously varies. In the same way as the extra features of the slot, the Furious Four’s most valuable symbols are themed for the game’s four chosen gods and goddesses. Those symbols, in order of value from most to least, are those which depict Apollo, Pandora, Haphaestus and Atlas. Five of the Apollo symbols along and active payline triggers a jackpot worth 2000 times the line bet, which is highest available behind that triggered by the five wilds combination. Five of the Pandora, Haphaestus and Atlas symbols, meanwhile, pay out at rates of 1500, 1000 and 750 times the line bet respectively. There are two different ways in which Age of the Gods Furious Four players can alter the amount they bet per spin. Those are by changing the number of active paylines for each spin and the size of their bet per line for the spin. The slot’s default is to have all of its 20 paylines active, but players can choose to activate anywhere from just one all the way up to that 20 for each different spin. Line bet options, meanwhile, stand between a minimum of 1p and a maximum of £5 which means that the overall minimum possible bet is 1p and the maximum possible is £100. 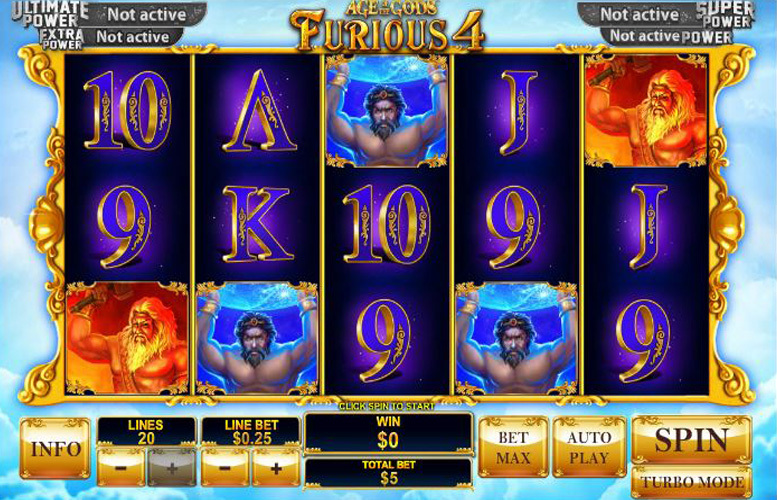 One of the simpler of the Age of the Gods slot games, there is still plenty to admire about Furious Four. The game does, after all, still boast a connection to four separate progressive jackpots and feature gameplay that is fun and immersive. That gameplay is made so fun and innovative by the inclusion of awesome additional features, including wild symbols, scatters and free games with a whole host of different ‘Furious Features’ introducing new ways to win. One area in which you could criticise Furious Four, however, is that of its top payline jackpot which stands at a comparatively less generous £50,000. What should be taken into account, though, is that other jackpots below that maximum payout do not fall away in value as quickly as is the case with many other slots. This game has a rating of 4 / 5 with 593 total reviews by the users.